Disclaimer : This is not the official website of CBSE-NET. 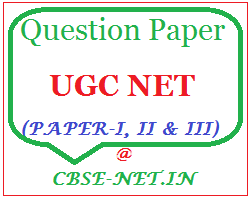 Download UGC NET Question Papers of June 2015 exam. CBSE conducted UGC NET June 2015 Exam on 28.06.2015. You can get here all question papers of NET Exam June 2015 - Paper-I, Paper-II & Paper-III. Click the below links to get download question papers subject-wise and paper-wise.